Soils represent the world's largest reservoir of carbon (C), but the vulnerability of this C sink under a rapidly changing climate remains uncertain. Much of this uncertainty stems from a poor understanding of the environmental controls on soil organic matter (SOM) formation and decay. In my research, I use gradient-based approaches to examine the natural variation in soil C stocks across diverse landscapes, and to link these patterns with important environmental drivers (e.g. climate, vegetation, and soil mineralogy). Owing to an abundance of industrial and automotive fossil fuel burning in the northeast United States, rates of atmospheric pollution have historically been high for this region. Consequently, red spruce forests have shown considerable sensitivity to the effects of nitrogen (N) deposition, with notable declines in forest productivity and health. My research examines the legacy effects of N deposition in high-elevation red spruce ecosystems in West Virginia, and whether historically high N inputs translate to contemporary changes in nutrient availability, plant C balance, and soil respiration. Another key gap in our understanding of soil C cycling is how soil microbes control the turnover and stabilization of SOM. 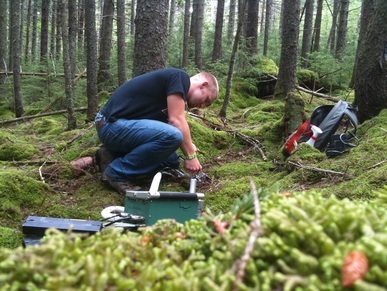 Using both laboratory- and field-based approaches, my research employs novel techniques to test how temperature, substrate chemistry, and soil mineralogy interactively affect microbial processes and the subsequent development of stable soil C.
Tyler Davidson (2011 REU student) measuring root respiration using the LI-6400.